Twenty dollars is a great price to make a room more lovely and comfortable. One of my favorite things about throw pillows is that you cannot have too many of them. 😉 They add depth, color and texture to a room and they can bring added function too. You will have somewhere to lay your head anytime you are ready for a nap. And you will have the pleasure of picking them all up when your kids use them to make a fort. Take a look at a living room that you love online or in person. Now count how many throw pillows are in the room. There are usually at least four. 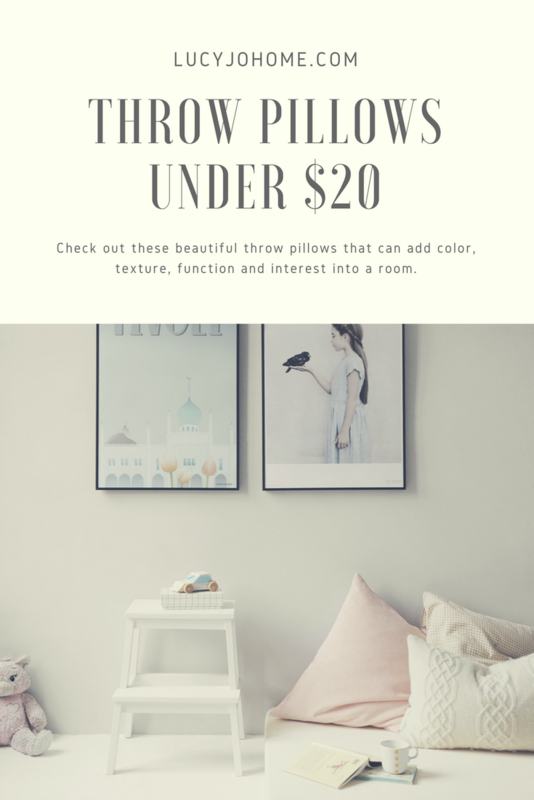 Consider how a well chosen throw pillow could add interest, beauty and function into a room in your home. It is usually a good aesthetic investment. Here are a few of my favorite throw pillows from Target. All of them are under $20 except one that is under $30. This is the only pillow that is $30 instead of under $20. It is on sale and these colors are so beautiful I had to add it to the list.